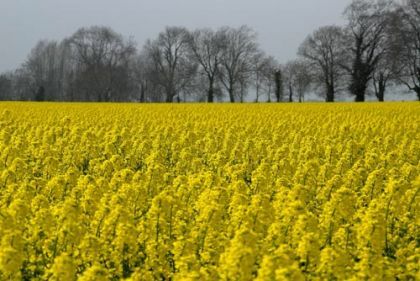 From late April through the summer to August, spectacular fields of this luminous yellow plant are on view throughout Ireland. 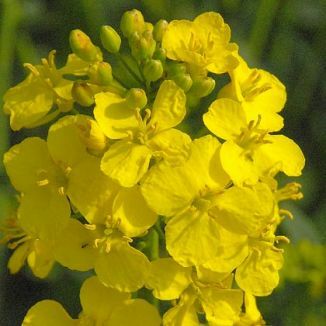 A crop which is planted for its yield of oil-seed, it often escapes and finds its way onto all sorts of waste ground, other arable fields, roadsides and ditches. Each plant reaching 150cm high, the yellow flowers (12-25mm across) are held on blue-green stems in loose racemes, the unopened buds above the open flowers. This is a blossom which is extremely attractive to bees seeking nectar and they in turn help to pollinate this annual or biennial plant. The fleshy leaves are also blue-green, leathery, clasping the stems, the lower basal leaves wither early. The seeds are in long, slender beaked pods up to 7cm long. This is an introduced plant and it belongs to the family Brassicaceae. I first came across this plant in 1977 on some waste ground in Dalkey, Co Dublin and I photographed it as a crop near Ballitore, Co Kildare in 2007.